Can’t believe the leaves are turning….WTF? Another summer has raced by us, and fall is right around the corner. 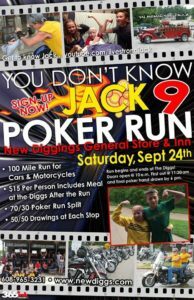 As most of you know, we moved the “You don’t know Jack” run from July to the last week in September, which is right around the corner. This year it falls on Saturday September 24th. We will be leaving the Diggs around 11:30, so come on down and have some fun as well as help us raise a little$ for cancer research. Get out there and enjoy life!